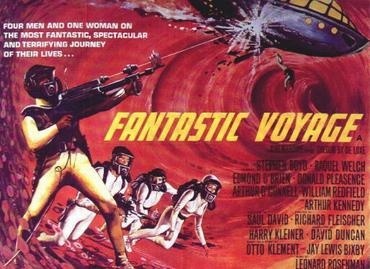 Do you remember the classic movie, Fantastic Voyage? If not that, then at least Raquel Welch’s jumpsuit? It’s fun to think about how 21st century science has actually caught up with 1960s science fiction. In this case, think mini-submarines going inside the human body. Scientists at Technion-Israel Institute of Technology have been working on a tiny scanning robot. It’s designed to swim through the body and send images back to a TV monitor. The microbot is less than half an inch long and one-sixteenth of an inch wide. It’s injected into the spinal canal. There, its twin wire tails are activated by an electric current, sending the ‘bot zipping off. As it swims, it takes biopsies and delivers drugs. It’s not widely available yet, but what is, is the also-Israeli-invented Pillcam. You swallow the Pillcam, which doesn’t need a propeller. Why? Because it’s pushed down the same route as waste through your colon! And voila, a kinder, gentler colonoscopy. Which of course results in its own colorful movie! If maybe not an instant classic.